ALTHOUGH many pious souls had been accustomed, in the silence of their secluded lives, to venerate the sacred Heart of Jesus with great devotion, still our divine Savior desired that the boundless love of His Heart might be known by all [people], and that a new fire of love should thereby be kindled in the cold hearts of Christians. For this purpose He made use of a frail and little-known instrument in the person of Margaret Mary Alacoque, a nun of the Order of the Visitation, at Paray-le-Monial, France. One day, when, according to her custom during the octave of Corpus Christi, [pre-vatican II article] she was deeply engaged in devotions before the Blessed Sacrament, the divine Savior appeared to her, showed her His Heart burning with love, and said: "Behold this Heart, which has so loved men that it has spared nothing, even to exhausting and consuming itself, in order to testify its love. In return I receive from the greater part only ingratitude, by their irreverence and sacrilege, and by the coldness and contempt they have for Me in this sacrament of love. And what is most painful to Me is that they are hearts consecrated to Me. It is for this reason I ask thee that the first Friday after the octave of Corpus Christi be appropriated to a special feast to honor My heart by communicating on that day and making reparation for the indignity that it has received. And I promise that My Heart shall dilate to pour out abundantly the influences of its love on all that will render it this honor or procure its being rendered." 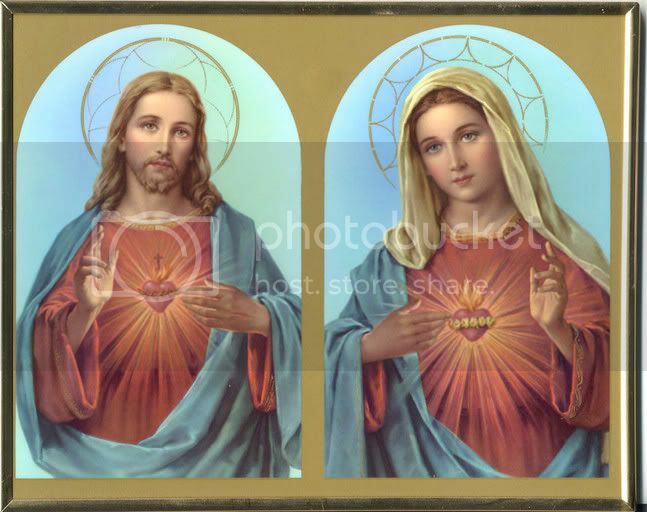 Margaret obeyed, but met everywhere the greatest opposition, until finally, when she became mistress of novices, she succeeded, by the help of her divine Spouse, in animating her young charges to venerate the sacred Heart of Jesus. But this was not sufficient for her zeal. She persevered until she softened the opposition of the nuns, and kindled in all an equal devotion towards the most sacred Heart. Thence the devotion spread to the adjoining dioceses, where confraternities in honor of the most sacred Heart of Jesus soon sprung up. Pope Clement XIII, after having instituted a most rigorous examination of the whole affair, commanded that the feast of the Most Sacred Heart of Jesus should be solemnly celebrated throughout the whole Catholic Church every year, on the first Friday after the octave of Corpus Christi. THE DEVOTION TO THE SACRED HEART OF JESUS. In the divine Heart of Our Savior we must not imagine an inanimate heart, separated from the person of Christ, but the living heart of the God-Man, the center of all His affections, the fountain of all His virtues, the most touching emblem of His infinite love [for all]. The Church venerates the cross, the blood, and the wounds of the divine Savior, by feasts which have their proper masses and lessons, in order, by meditation upon these objects, to awaken in us a more fervent devotion to the Redeemer. How much more worthy, then, of our devotion is the sacred Heart of Our Savior, since all its thoughts, movements, and affections aim at our salvation, and it is always ready to receive truly penitent sinners, to pardon them, to restore them again to God's favor, and make them partakers of eternal happiness. Grant, we beseech Thee, Almighty God, that we who, glorying in the most Sacred Heart of Thy Son, commemorate the chief benefits of His charity towards us, may equally rejoice in their acts and fruits. The the same Jesus Christ our Lord, etc. Is. 12:1-6 This epistle is a song of gratitude for the deliverance of the Jews from the hands of their enemies, and at the same time a prophecy of the coming redemption of mankind from sin and death, through Jesus Christ. "You shall draw waters with joy out of the Savior's fountains." These fountains are the graces which Christ has obtained for us on the cross, but particularly, says St. Augustine, the holy sacraments of Baptism and Eucharist. We should rejoice over these graces, particularly that the holy One of Israel, Jesus, the Son of God, is in the midst of... Church, in the Most Holy Sacrament of the Eucharist, remaining there until the end of time. Oh, let us often approach the ever-flowing fountain of all graces, the Most Holy Eucharist, and with confidence draw consolation, assistance, strength, and power from this fountain of love. John 19:34 Douay-Rheims "But one of the soldiers with a spear opened his side: and immediately there came out blood and water." Compare the NAB and footnote 15. According to the Jewish law, a criminal could not be put to death, nor could the body of one who had been executed remain on the place of execution, on the Sabbath-day. The Jews therefore, asked Pilate that the bodies of Jesus and the two thieves should be buried; but before this could be done, according to the Roman law, the legs of the crucified had to be broken with an iron mace: this the soldiers did to the two thieves, who were still alive; but when they found that Jesus was dead, one of the soldiers, whose name was Longinus, opened His side with a spear as had been predicted by the prophets. Jesus permitted his most sacred Heart to be opened - 1. To atone for those sins which come forth from the hearts of men, as Christ himself says, "For from the heart come forth evil thoughts, murders, adulteries, fornications, thefts, false testimonies, blasphemies" (DR. Compare Matt. 15:19). 2. To show the infinite love with which he first loved us, and to which the spear should point us. 3. To show that there was nothing so dear to Him that He would not give it to us, since, for our salvation, He shed the last drop of His heart's blood. To provide, as it were, an abode in His opened side, according to the words of St. Augustine: "The Evangelist is very cautious in his language; for he said, not the soldier pierced or wounded His side, but he opened it, that thereby there might be opened to us the door from which flow into the Church those holy sacraments without which we cannot enter into true life." When temptation assails us, or sorrow depresses us, let us flee to this abode, and dwell therein until the storm has passed away; according to the words of the Prophet, "Enter thou into the rock, and hide thee in the pit" [DR but compare Isa. 2:10]. For what is the rock but Christ, and the pit, but His wound? "My loving Jesus, I (name) give you my heart; and I consecrate myself wholly to you out of the grateful love I bear you, and as a reparation for all my unfaithfulness; and with your aid I [intend] never to sin again."